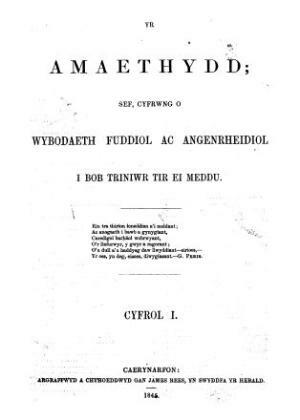 A Welsh language periodical mainly covering agricultural affairs. Rather than being an independent periodical it came as a monthly supplement to the Carnarvon and Denbigh Herald. The periodical was edited by the minister, poet and critic, the Reverend William Williams (Caledfryn, 1801-1869) and was printed by James Rees, Caernarfon. Associated tiltes: Carnarvon and Denbigh Herald.